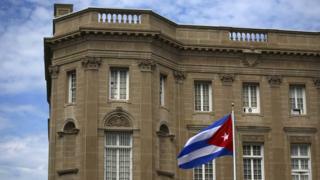 The US has expelled 15 Cuban diplomats, saying Havana failed to protect US diplomats from mysterious acoustic attacks. Cuba's Foreign Minister Bruno Rodriguez called the move "unacceptable". The Department of State move follows last week's US withdrawal of more than half of its own diplomats from the Cuban capital. Nearly two dozen US personnel have suffered unexplained ill health in the city. "The decision was made due to Cuba's failure to take appropriate steps to protect our diplomats in accordance with its obligations under the Vienna Convention. This order will ensure equity in our respective diplomatic operations," US Secretary of State Rex Tillerson said in a statement on Tuesday. The Cuban diplomats have been given seven days to leave. Mr Rodriguez said the move was "unjustified". At least 21 people working at the US's embassy in Cuba have reported health problems, ranging from mild brain trauma and deafness to dizziness and nausea. Cuba denies targeting embassy staff, and the US has not blamed the country's government for the suspected attacks. The Cuban response to the Trump Administration's decision to expel two-thirds of its diplomatic staff from Washington was predictably outraged. The US had been "irresponsible" and "hasty" the island's Foreign Minister Bruno Rodriguez said, insisting that the State Department hadn't provided "a shred of evidence" as to the harm caused to US diplomats in the alleged attacks. Cuban doctors had not had any access to either the victims or the US medical staff attending to them, Mr Rodriuguez added. Cuba-US relations are at a low ebb once again, almost completely erasing all the goodwill built up over the Obama presidency in a matter of months. Millions of Cuban families are caught in the middle with visas for Cuban visitors to the United States suspended. The only glimmer of hope is that relations haven't been broken altogether and that the Cubans reiterated their willingness to work with the Americans to find a solution. "We continue to maintain diplomatic relations with Cuba, and will continue to co-operate with Cuba as we pursue the investigation into these attacks," Mr Tillerson added in his latest statement. Last week US officials said: "We don't know the means, the methods or how the attacks are being carried out."